In the forthcoming book Abundance: The Future Is Better Than You Think, Peter H. Diamandis (chairman and CEO of the X-Prize Foundation and cofounder and chairman of Singularity University) and award-winning science writer Steven Kotler give us an extensive tour of the latest in exponentially growing technologies and explore how four emerging forces — exponential technologies, the DIY innovator, the Technophilanthropist, and the Rising Billion — are conspiring to solve humanity’s biggest problems. 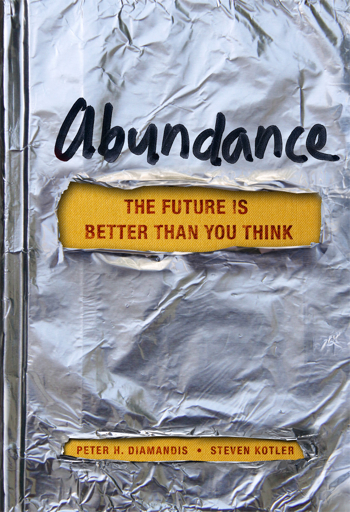 “This brilliant must-read book provides the key to the coming era of abundance, replacing eons of scarcity,” says Ray Kurzweil, inventor and author of The Singularity is Near. The authors make a compelling case for optimism. We are introduced to dozens of innovators and industry captains making tremendous strides in healthcare, agriculture, energy, and other fields: Dean Kamen’s “Slingshot,” a technology that can transform polluted water, salt water, or even raw sewage into incredibly high-quality drinking water for less than one cent a liter; the Qualcomm Tricorder X-Prize, which promises a low-cost, handheld medical device that allows anyone to diagnose themself better than a board-certified doctor; and Dickson Despommier’s “vertical farms,” which replace traditional agriculture with a system that uses 80 percent less land, 90 percent less water, and 100 percent fewer pesticides, with zero transportation costs. As a bonus, the authors provide a detailed reference section filled with 90 graphs, charts, and graphics offering much of the source data underpinning their conclusions.